The Kwik Fit site on London Road has been empty for some time. An old planning permission for flats on the site has lapsed, and a new owner has been consulting on a new planning permission. The plan as it currently stands is for 22 flats above 280 square metres of commercial space on the ground floor. We have put forward some comments on the scheme. 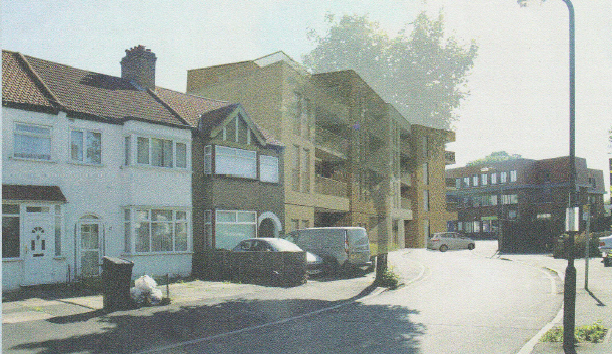 In due course the developer will decide whether to take the scheme forward as a planning application. The artists drawings from a booklet made available at the recent public consultation event gives a view of the development from several angles – and give a very good idea of the effect it would have on the local area. This entry was posted in Cricket Green Conservation Area on July 22, 2015 by mitchamcricketgreen.